Packed with friendly guidance, practical tips, and first-person stories, this book reveals the best ways to provide effective, respectful services to students in inclusive classrooms. The book answers all the urgent questions paraprofessionals have as they navigate their complex job in the inclusive classroom, showing readers how to provide skillful and subtle support to students while encouraging their independence, resolve challenging behavior in gentle and positive ways, find students strengths and match support practices to them, appropriately fade their support, and make informed decisions about content-specific accommodations, modifications, and adaptations. The book shows how to presume a student s competence and keep expectations high, facilitate peer supports and friendships and partner with teachers, SLPs, psychologists, families, and other members of the educational team. 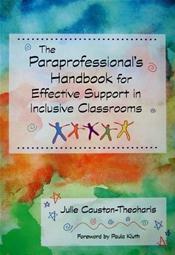 To help them master the daily ups and downs of the inclusive classroom, paraprofessionals will get ready-to-use practical content, including tips for supporting students with specific disabilities, helpful question-and-answer sections, examples of successful problem-solving, a quick-guide to acronyms in education, and easy ideas for improving teamwork. The essential guide for every paraprofessional and a must-have for the educators and other professionals who support them, this empowering book takes the guesswork out of a critical classroom role and helps students with disabilities reach their full potential.